All-inclusive! 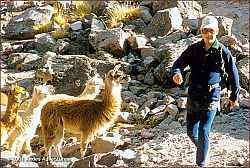 From $3.795 including ground transportation in Perú, quality hotels, all meals, guided tours, first class camping and full mountain support. See our FAQ and the detailed itinerary for complete information. After a night of rest, we leave for the Cordillera (mountain range) Vilcanota and the high circuit around Mount Ausangate, a glacier covered 20,905 foot massif; its highest peak. Inside the loop we encounter Mounts Jatunuma, Maria Huamantilla, Janajaja and Santa Catalina (19,055'). As we turn into the east side of massive Mount Ausangate, we will admire the Cordillera Vilcanota, offering views of Mounts Collque Cruz (20,046'), Collpa Ananta (20,046') and Tres Picos (19,990'). Other snow-capped peaks in this mountain range crowd the horizon with massive glaciers, rewarding us with scenery unsurpassed anywhere in the Andes. 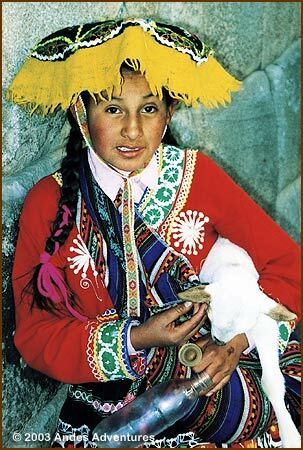 Just as fascinating are the people of the Vilcanota, the most traditional and colorfully dressed of all the Peruvian highlanders, living the same way that their ancestors did in Inca times. • Enjoy two days exploring Machu Picchu. • Circuit spectacular Mt. Ausangate. 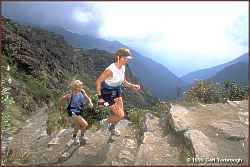 The Peruvian Andes Running Adventure follows the original pilgrimage trail that leads into the religious capital of the Inca Empire, the legendary “Lost city of the Incas” - Machu Picchu! 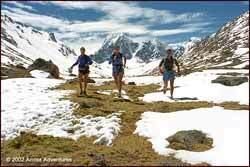 The run is moderate to strenuous over mountain terrain at altitudes ranging from 8,000’ to 13,779’. You will see archaeological sites only seen by those that complete the entire Inca trail. On the Inca Trail, you will sleep in a comfortable campground, and porters carry the gear. In the Ausangate circuit you will run at higher elevation with a gradual adaptation to the terrain and go over a 16,650’ pass with an option to reach 17,000’.